Find hotel near Ayuntamiento De Alicante ..
A must see for architecture admirers, the Ayuntamiento de Alicante’s building is a marvellous site to behold. With its baroque civic architecture, it has twin towers having 35m heights. Within the building is a blue room, the plenary room and a chapel. There is a dramatic statue of Dali as well as a small metal disc indicating an instrument that is used to measure the height above sea level in all other parts of Spain. Bus stop outside the town hall. 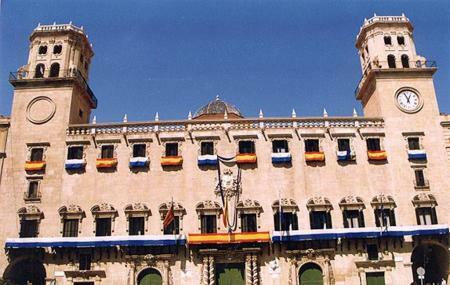 How popular is Ayuntamiento De Alicante Or Town Hall? People normally club together Mercado Central and Mount Benacantil while planning their visit to Ayuntamiento De Alicante Or Town Hall.